Irresistibly crunchy Thai salad with creamy peanut dressing will be your new vegetable obsession! Each bite packs a powerhouse of fresh superfoods. Crisp, satisfying and full of nutrients! This crunchy Thai salad tossed in a creamy peanut dressing will be your new salad addiction. Each bite contains a powerhouse of fresh superfoods and a peanut flavor punch to match. 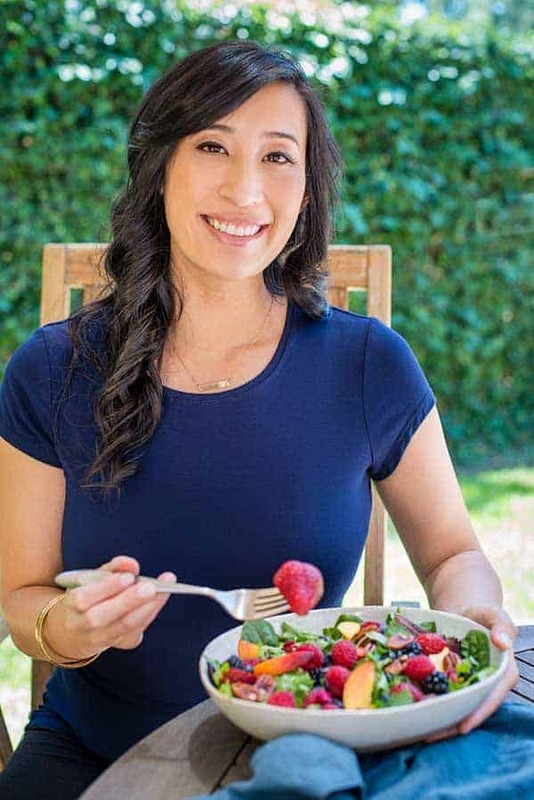 If you are looking for a quick, wholesome and exciting meal that you can enjoy for dinner or pack for lunch the next day, this salad will make your taste buds super happy. A few chops with your chef’s knife and a blend of the sauce, and you’ve got your next veggie-packed meal ready in minutes. This Thai salad screams summer, with the rainbow of colors and tropical mango slices it makes me want to hop on the next flight to Phuket! It’s so easy to find the freshest produce and ripe fruit at the market right now. Summer is in high gear, and it’s like the grocery store is just giving away mangoes! To balance the slight bitterness of the kale greens, mangoes, and sweet red bell pepper add just the right amount of natural sweetness. I’d like to take a quick poll… Raise your hand if you LOVE peanut sauce? You know, the kind you can usually find with chicken satay or served with shrimp spring rolls? Not only is this Thai salad so tasty, but it’s also packed with those superfoods I mentioned up top! The kale, two types of cabbage, red bell peppers, carrots, green onions, and lime juice are all some of the top nutrient-dense superfoods you can enjoy. Yes, you can have your cake and eat it too, but in this case, it would be a delicious salad with an addictive peanut sauce, ha! After shooting the photos for this recipe, it was getting to be around 1 pm, and I couldn’t wait to gobble this salad up! Each forkful is so refreshing, plus the light drizzle of peanut sauce hit the spot. You can instantly turn this salad into an entree by adding some grilled tofu, chopped chicken, beef or shrimp. What is the difference between peanut butter vs. peanut spread? There are a lot of options on the market for peanut butter products. Peanut butter labeling is regulated by the FDA and must contain at least 90% by weight of peanuts. There also may not be any added artificial colors, preservatives or sweeteners. The other 10% can be seasoning and stabilizing ingredients like salt, sugar, palm oil or peanut oil for example. If the amount of non-peanut ingredients exceeds 10%, then it would be labeled as a spread. You have most likely seen natural ground peanut butter separate over time and have oil on the top when you open the jar. Oils like palm oil are added when processing the product to prevent separation and make a more creamy spreadable product. Irresistibly crunchy Thai salad with peanut sauce dressing will be your new vegetable obsession! Each bite packs a powerhouse of fresh superfoods all in one bowl. In a large bowl add kale, cabbage, bell pepper, carrot, mango, cilantro, mint, and green onions. Set aside and make the dressing. 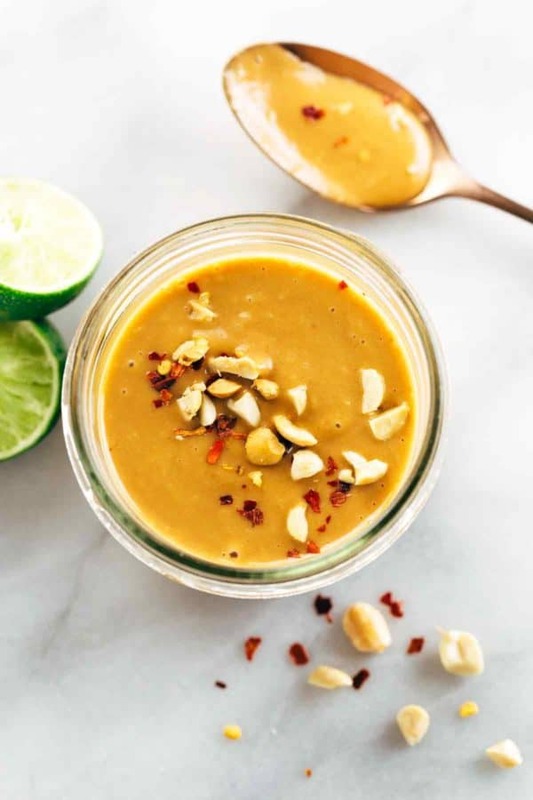 In a blender add peanut butter, lime juice, honey, vinegar, soy sauce, sesame oil, sriracha, ginger, garlic, and water. Puree until smooth and combined, about 1 minute. Alternatively, the ingredients can be whisked together in a medium-sized bowl. Add more water if needed to thin out the dressing if desired. Season with salt and pepper as needed. To Serve: Gradually add enough dressing to coat the salad, toss to combine. Drizzle with more dressing if there is any remaining. Top with freshly cracked black pepper and chopped peanuts. If you like the dressing less sweet, start with 1 tablespoon honey and gradually add more to taste. Jessica, I like your creativity with your recipes but the last several have all been in a bowl. I would suggest offering a blend of recipes in a bowl with others. Thanks for website and continued creative recipes. Absolutely gorgeous! I love how bright and colorful your recipes are. They all look delicious and I’m definitely making this one today. Thank you SO much Tristan! I love eating a rainbow of colors 🙂 I can’t wait to hear what you think! Totally agree Brittany! I love incorporating as many colors as I can, so yummy plus lots of health benefits 🙂 Thank you for your lovely comment! The Crunchy Thai Salad with Peanut Dressing was very tasty. My only feedback would be to gradually add the honey if you are concerned about it being too sweet. Other than that, it was a great summer salad that I served with grilled flank steak. Thank you so much Lynn for your feedback! I appreciate any comments to improve the recipe, I’m sure other readers will find it helpful as well! I agree! I started with 1 T, planning to add more if needed. It really was sweet enough for me without anymore. Delicious and just what I was looking for to go with a dinner of Coconut Curry Shrimp. I’m so thrilled to hear you enjoyed the recipe Monica! I just consider the chopping as my arm workout, hehe. This look amazing, and has just made its way to my weekly menu. I made this salad for dinner last night and it was absolutely delicious! Three of us devoured it; not even a shred of cabbage left in the bowl. We really enjoyed this recipe. Saving it to make again and again. Thank you for sharing it with us! Thank you so much for this recipe. The peanut sauce was absolutely divine! My hubby and I both wanted to just slurp it up by itself. We had the salad with a grilled pork tenderloin for the protein. So yummy! Will make often, I’m sure! I’m not a fan of kale ( I know, shame on me, lol). Could I use baby greens or choppped romaine instead? Hi Jackie! Yes, you can absolutely use baby greens or romaine as a substitute. Romaine may give the most crunch! Made this tonight for some pals and it went down a treat! I couldn’t find napa cabbage so used savoy instead and it was still very tasty! Will definitely be making again. Yay Laila! I’m so happy to hear everyone enjoyed the recipe. Smart substitute for the napa cabbage with the savoy! 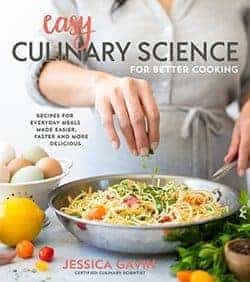 Hi Jessica, can you make peanut dressing day before? Thank you so much Jessica. Salad looks amazing, can’t wait to make! Everyone wanted your recipe! Was a huge hit. Thank you! Can you make the salad dressing a day ahead? I serve Thai Curry on Christmas but due to commitments must have it all prepared except for some chopping the day ahead. I saw the nutrition info per serving- what are the actual serving sizes? Hi Katie- Great question! The serving size is approximately 1 1/2 cups of salad. Today’s dinner was a salad inspired by this recipe – I don’t like kale and cabbage, I simply replaced it with mixed greens. The peanut dressing is absolutely addictive – and so simple! Something funny happened though when I mixed it in the blender – it became a paste! It became wonderfully creamy after adding a lot more water than the recipe said. Any ideas why this happened? Maybe I over-mixed it? Thank you for your feedback Rike! Sometimes when honey and peanut butter is blended together (like when you make peanut butter), the mixture sometimes heats up from the shear of blending and the sugars cause the peanuts to seize up a little and thicken (especially if it becomes warm), like the paste you experienced. Adding the additional water after the initial blending definitely helps to loosen up the dressing. So yummy, I could eat this every day happily! Thanks for another great recipe, Jessica! Just wanted to thank you for posting this recipe. I made this last night to go with a piece of salmon and it was fresh, crunchy and absolutely delicious! I couldn’t get the kale but it worked even without it! Peanut sauce was also so scrumptious. I substituted sriracha with sriracha mayo (as I didn’t have sriracha) with a little extra chilli flakes for an added kick, I think it still worked out well. Flavours transported both my partner and I back to Thailand. We will definitely be eating this more often! Totally scrumptious ???? I added chicken to this, otherwise followed to a T and it was delicious and healthy! Your photos show a generous sprinkling of red pepper flakes, but I don’t see them mentioned in the recipe. I added them to the peanut sauce, and have made this recipe several times in the past few weeks. Perhaps I missed the red pepper flakes in the recipe, but , if they are indeed not there, it would be a great suggestion to add to the posts. It’s a wonderful salad that our extended family loves. Thank you. Thanks for the feedback Judith! How much do you use? I will definitely add it to the recipe. I doubled the recipe and followed to a T. The dressing is perfectly balanced with the salty, sour and sweet with a hint of heat! It’s amazing! Thanks for sharing! This was delicious, thank you Jessica! thought I had honey in the cupboard but didn’t but it didn’t lack it I think. Will definitely be making this again!